I had traveled many miles to hunt Antelope. I was carrying a Ruger .243 Win with a 4.5x14 Nikon Buckmaster scope. I was shooting Winchester factory 100 g Powerpoints. I could not go after the bigger animals with this combination, but it would suffice for Antelope. The Antelope were territorial. The big males escorted a herd of females and fought for this right. The big males weighed about 125 pounds and sported black backswept "Harley-Davidson" horns. A good male would have 15-16 inch horns. My guide Adam and I spotted a large male Antelope with one horn longer than the other. Adam said the horn had mass. I put my scope on the Antelope but could not stop the crosshairs from wavering. The Antelope ran away. Adam said that animals can sense evil intent from hunters and try to escape. We carefully glassed the terraine and spotted a herd about one mile away. We traveled to a hill overlooking the herd. We climbed the hill and saw three large male Antelope among the females. I crawled over the summit of the hill, put down my rifle so that it rested on the bipod pointing down hill. Adam chose a good animal for me. I quickly aimed and took a shot. The shot missed and the herd started to run. I snapped off another shot and missed again. Adam got quite perturbed with my wild shooting. He made me walk back to the truck alone. I felt bad. I pulled out some dried meat and gave some to Adam. He said the meat always brings luck. We glassed another large herd in a wide expanse of green grass which I called the Serengeti. It was a verdant and beautiful setting. We prepared another ambush. We crawled up a hill overlooking the herd. We had to crawl through thorns and prickly brush. We reached the summit. Down below in the Serengeti were three Antelope males; two large ones at 300 yards, and one smaller one at 200 yards. I did not want to miss again so I decided to try for the Antelope at 200 yards. I carefully placed the crosshairs behind the left shoulder and slowly squeezed the trigger. The Antelope dropped at the shot in it’s tracks. We climbed down the hill and went up to the Antelope. The bullet had entered behind the left shoulder and exited out the right kidney. Adam measured the horns and they were 14 inches. He smiled and congratulated me. I was happy with my first antelope. This all happened in Wyoming, USA, in 2004!! In 2007 I decided to journey to Namibia, Africa, for a shooting Safari. After five days I had been very successful and had used my Ruger .300 Win Mag to harvest Red Hartebeest, Zebra, Gemsbok, Warthog and Kudu. I needed to harvest a Kalahari Springbok. great horn size in Namibia. Some call the Springbok from the Namib Desert the "Holy Grail" or "Methusalem" of Springbok because of their large back swept "Harley-Davidson" horns. The Springbok is similar to the North American Pronghorn Antelope and occupies a similar ecological niche. I had a lot of experience hunting Pronghorn in Wyoming and was looking forward to my hunt in the Namib Desert to hunt Springbok. My PH Barry, my tracker and driver Yassir, and I entered the Namib Desert at the town of Khorixas. We gassed up and bought water. We ventured into the Namib Desert; the country became increasingly desolate as we pointed the truck on a track north of the Brandeberg Escarpment. The Mopane trees were becoming scarce and the land appeared to be dry and lifeless. However, there were many herds of Springbok about. Every ram had his territory and a herd of females. Barry said that at certain times of the year the herds of Springbok would gather by the Brandeberg and they would number in the thousands. We came to a flat plain. Barry spotted a nice Springbok Ram. I took careful aim but missed. Barry said that this was a trophy of a lifetime. We followed the ram and I got another shot. This time I aimed carefully with my rifle supported by the bipod and sent a 180 g Cor Lokt bullet into the ram, dropping it in its tracks. The ram extended it’s pronk after it died. The pronk is a pocket of long white hair that opens on the animals dorsal area when it is excited or in it’s death throes, hence it’s scientific name Antidorcas marsupialis. The pronk smells like sweet cotton candy when one sticks his nose in it. My Springbok sported 15.5 inch horns... a true trophy. Gold Medal Class in Namibia. We stopped at midday and rested under a large Mopane tree. Yassir skinned the Springbok and salted the cape and hide. We made a fire and grilled Springbok steak, kidneys, and ribs. After a nice rest under the Mopane tree we traveled deeper into the Desert in search of another Springbok. We came to a series of dry plateaus. There were many Welwitchia plants on the dry plateaus. These are fossil plants that only grow in the Namib Desert of Angola and Namibia. These plants have adapted beautifully to the harsh and dry climate of the Desert by developing a large underground trunk that enables the plant to search for water at great depths. We came across a herd of Springbok led by an extremely large bodied ram. I wanted to take a shot. Barry could not tell how large the horns were because the body of the animal for comparison was so large. I carefully aimed and squeezed off a shot at about 150 yards. The Springbok dropped next to a Welwitchia plant. We took some great photos. 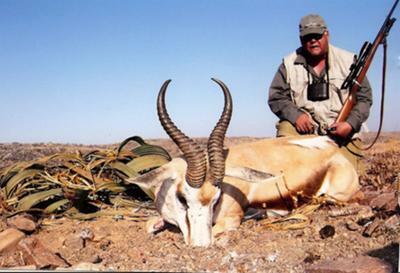 This ram was 16 inches, a true "Methusalem" from the Namib Desert!! From this experience I concluded that Springbok hunting in the Deserts of Namibia was every bit as fun as Pronghorn hunting on the Plains of Wyoming. Love the Wyoming and Namibia comparison. Great Harley-Davidson story with a twist. I would like to hunt a Springbok, eat it's steak and smell it's Pronk. Very good story! I learned something new today. Now I know what a pronk is. I am not sure I want to smell it though. Hungry for some Springbok pronk ! Forgot about angus steak, Springbok sounds tasty. Quite the creative writing...nice how the writer brought his experiences from both Wyoming and Namibia together in one story. I WANT TO GO TO AFRICA WITH MY GOOD FRIEND STEVE.MAY BE I CAN KILL A SPRINGBOK AND STICK MY NOSE IN HIS PRONK! Harley Horns? Honda is Better! I enjoyed the story of the hunting in the USA and in Africa. The Africa story sounds like it is out in nowhere land. I would be afraid to be that far out in the country. It was a good story to read. A good story with a clever surprise.